On March 2015, four years after the earthquake, the Ishinomaki Line opened and Onagawa Station resumed. A large white roof is made with the image of a sea cat and gives people a bright and soft impression. On the second floor there is also a hot spring facility, “Onagawa Onsen Yupoppo”, which has tile art "Family Tree" with a wish for reconstruction. This Onagawa Station is "The symbol of the town where the sea urchin flies". In December of the same year, when Onagawa Station resumed, the tenant-type commercial facility “Seapalpia Onagawa” was rebuilt along the promenade that extends to the sea. A shopping district with low-rise brown buildings continues, and there are a wide variety of stores such as restaurants, material packing shops handling cardboard, diving shops and pharmacies, and flower shops with beautiful flowers. Along the way, I went to the fruits shop and bought a bright red ripe strawberry from Ishinomaki from an assortment of fresh vegetables and fruits. Delicious "Onagawadon" at a market filled with seafood from Sanriku "Local Market Hama Terrace"
I went down the slope and arrived at Onagawacho Food Center "Local Market Hama Terrace" which opened in December 2016. Sanriku fishing grounds, which are said to be "one of the three major fishing grounds in the world", are right in front of you. “Hama Terrace” sells seasonal seafood and sweets from Onagawa, focusing on fresh fish and processed fish products. In addition, handmade organic soap is sold, and you can experience making soap in the shop. "Hama Terrace" is a facility with 8 stores based on the concept of "sea". It was "Onagawa-don" that I had in the Hama terrace. An excellent dish prepared by the landing of the day, such as , tuna, salmon, shrimp, mekabu, salmon etc., are very fresh, and the fish meat is slick and delicious. After a meal, Ishinomaki strawberry! The smell of spring is full. The Spanish tile that colors "Onagawa town" that has lost its color . On the Hama Terrace, you can see the walls of the Spanish tiles, which are scattered in various colors. This is the idea of Narumi Abe, who is representative of Minatomachi Seramika Kobo, a shop of Sea Palpia Onagawa, that "I want to lighten the colors of Onagawa town with Spanish tiles!”. Using Spanish materials and techniques, hand-painted one by one, colored and baked, the tiled patterns will paint "Onagawa town" one after another without fading. At the workshop, the participants produce two coasters, one at hand, and the other signed by myself, donated to Onagawa. Four bells were attached to the clock set in the old Onagawa station building. It sounded at the time of arrival and departure of the train and was familiar to people. From rubble's mountain after the earthquake, the bell of the clockwork clock which was at Onagawa station was found miraculously in perfect condition. The bell was displayed as a symbol of the shopping street and became the name of the shopping street. 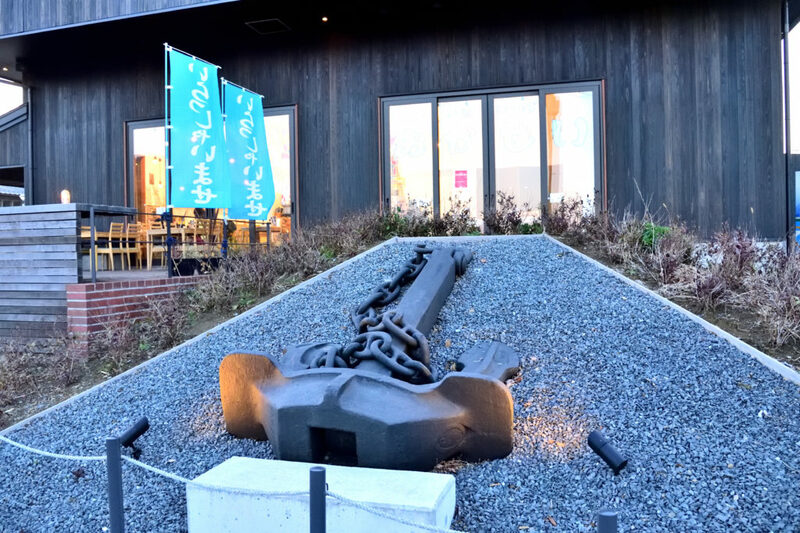 At the entrance to the sea of the Seapalbia Onagawa, a new bell of hope was installed as a symbol of reconstruction. Onagawa Town's slogan "To a town where a new start is born" Onagawa Town is steadily beginning to move toward a new future.